Atari’s 8-bit console had a short-lived shelf life, meaning its collection of games is quite slim. Fortunately for owners it was host to some cracking arcade conversions and has gone on to receive a great number of cool homebrew games. Here’s some of our personal favourites. How many have you played? The first coin-op game to inspire fear in gamers with its boss’s demonic-sounding digitized voice, Atari was working on a port for its 8-bit computers when the company cancelled it due to its severe financial problems. Almost completely finished save for some minor points, it remained a distant memory while passing through many hands over the years. That is until recently, when a 5200 homebrewer ported the game to the 5200 and AtariAge decided to make full productions complete with great label art. The game truly shows off the 5200’s capabilities of reproducing early Eighties arcade titles, and the gameplay is great, successfully re-creating the franticness of the original. Yet another victim of Atari’s implosion, Millipede is a port of Atari’s seminal follow-up to its monster 1980 hit, Centipede. Ready to go and even listed in the 1984 catalogue back in the day, its axing meant that gamers wanting to play Centipede would have to either purchase the 8-bit computer version or wind up having to suffer through a pretty terrible 2600 port. That is until AtariAge once again came to the rescue with a full re-production. Millipede is truly a joy to play with the 5200’s Trak-Ball (yes, Atari spelled it with a “k”!) controller. The graphics and gameplay are spot on when compared to the original, with even the animated title screen re-created perfectly. Ballblazer was one of Lucasfilm Games’ first titles. Taking full advantage of the 8-bit computer and 5200’s scrolling capabilities, Lucasfilm managed to create a beautiful futuristic 3D ‘soccer’ match complete with continuous fractalised music. Because the partnership was such a big deal, Atari wanted to hold off the computer release to give the 5200 and then the 7800 some exclusivity. Unfortunately it wound up backfiring, and the company imploded during the interim, leaving 5200 owners having to wait until Jack Tramiel revived 5200 sales in 1986. What can be said about this bow-wearing beauty that hasn’t already been said? Well how about that the 5200 port is an extremely solid re-creation of her arcade appearance complete with all the fun intermission animations and different levels? This Atari conversion is a massive step up from the earlier-released Pac-Man for the 5200, as this time around the programmers concentrated more on re-creating the overall faithfulness of the arcade game rather than just the speed of the original. A very solid conversion that’s definitely worth tracking down if you are a fan of the arcade version. What can get crazier than a session of Eugene Jarvis and Larry DeMar’s classic in the arcade? How about a near-perfect port at home complete with dual joysticks? The 5200 version shipped with a special joystick coupler that enabled you to use both of the 5200’s controllers to play the game as it was meant to be played. The looser feeling of the 5200’s analogue sticks truly makes the fast multi-directional twitching a breeze to carry off. Some even like playing it on here better than the original. Another fantastic arcade conversion that 5200 collectors should immediately seek out. 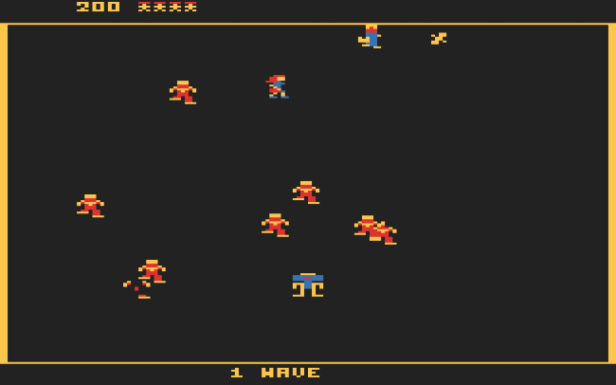 You simply can’t say you’ve experienced gaming on any Atari platform until you’ve spent time playing this classic. Designed for Atari’s computer line in 1979 to show off their advanced capabilities, it was popular enough to later port to the Atari 2600, 5200, ST, and even inspire a graphic novel by DC comics. You’re treated to a first-person view of a cockpit going through space, reminiscent of Exidy’s Seventies classic Star Fire. With gameplay similar to the classic Star Trek text game, you go from sector to sector (via your trusty galactic chart) clearing each of those pesky Zylon ships. Castle Crisis is a homebrew game by veteran programmer Bryan Edewaard, and fans of the multiplayer coin-op favourite Warlords will be happy to learn this is a graphically arcade perfect port of that game, even though it doesn’t share the same name. Which you would expect considering the arcade version ran on virtually identical hardware. The Atari 5200’s analogue controllers are simply perfect for the precision needed to break out a pair of spinners, which is a problem that plagued many of the earlier ports of this game to other home consoles. No, this isn’t like Dana Marschz’s Hamlet 2. Atari 5200 homebrewer extraordinaire Ron Lloyd managed to create a legitimate follow-up to the hit 2600 classic, to the point of Atari giving its blessing in exchange for using it to create a scaled-down 2600 version for their Flashback 2 console. Keeping the fun gameplay of the original but vastly updating the graphics, Adventure II also includes plenty of new locations and foes to test you. It’s worth it to pick it up for the beautiful graphics alone, but the additional updates and expansions make this a fantastic game for the 5200. Another homebrew classic by Ron Lloyd, this is a completely original game featuring a cartoonish yellow helicopter. Like a chopper version of Rudolph the Red Nosed Reindeer, Koffi is not allowed to go with the bigger rescue ‘kopters’ on missions. But when he learns of an insidious plan by Pyro the Storm Cloud to burn down the forests, Koffi flies into action to protect the woodland and the animals that live there. In a take on US Games’ ‘Name This Game’ contest for its 2600 game release in 1982, AtariAge forum members were allowed to enter a contest to design one of the animals appearing in the game. Mattel was responsible for porting Data East’s coin-op classic Burger Time to the Intellivision (which is considered an excellent port), and its M-Network Publishing ported it to the Atari 2600, Apple II, and IBM PC. Unfortunately, the 5200 had zero chef love, which was a real shame. Thanks to Ken Siders, however, burger-loving 5200 owners can now build them all day long. Initially unveiled under the guise of an April Fool’s joke surrounding a “found” prototype, Ken thankfully soon revealed that he had coded it up and was soon looking to publish it as the complete game. Beef Drop is the excellent end result.